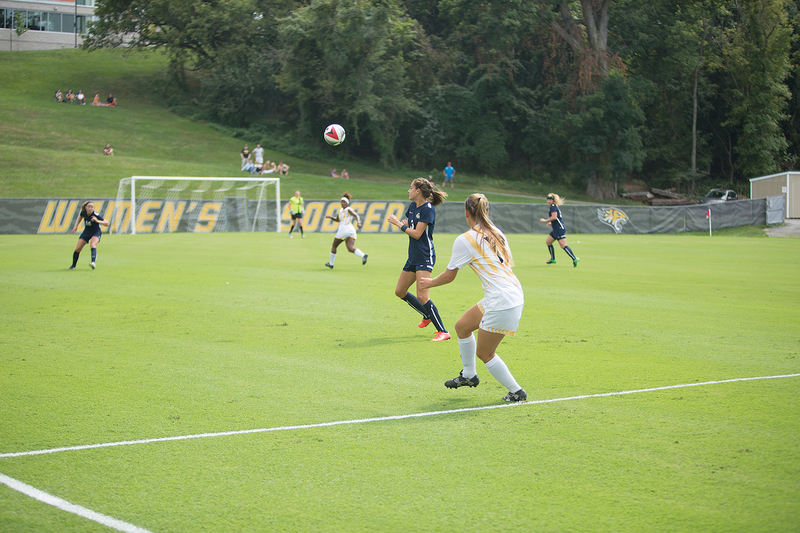 Towson kicked off Colonial Athletic Association (CAA) play on the road this weekend with a 2-1 win over William & Mary Sunday, but a 2-1 loss to Elon Friday. Sunday, the Tigers (4-7-1) defeated the Tribe (7-4-0) for their first ever victory at Martin Family Stadium. Towson was forced to come from behind as freshman midfielder Mackenzie Kober scored the first goal of the game for William & Mary 27 minutes into the match. The Tigers struggled to create chances in the first half and trailed 1-0 after the opening 45 minutes. The second half was a completely different story for Towson. Just three minutes into the half, senior midfielder Emily Marshall found freshman forward Justine Stoner. Stoner’s shot hit the underside of the crossbar and deflected into the goal to tie the game 1-1. With just eight minutes left, freshman forward Elizabeth Coletti sent a cross into the box and sophomore forward Mackenzie McCaull headed the ball into the back of the net to clinch the Tigers first conference win of the season. Friday, Towson fell to Elon (5-4-1) 2-1 as it opened up conference play. The Phoenix took a 1-0 lead, scoring the first goal of the game 31 minutes in, when junior forward Susannah Anderson fed a pass to senior defender Erin Tanhauser, who chest controlled the ball before ripping a shot into the net. The first half was fairly even as the Phoenix outshot the Tigers 5-4, and each goalkeeper made two saves. Towson senior stopper Taylor Sebolao was forced to do more in the second half, as she made nine saves to keep the team in the game. The Tigers’ resilience paid off as senior midfielder Marissa Green tapped in a rebound after Marshall had a shot from a free kick saved with just 13 seconds left in the game. However, the game’s decisive goal came in similar fashion as Elon junior defender Kendall Ballotti won the game with a rebound in double overtime. Towson will begin a five game homestand at the Tiger Soccer Complex this weekend as the team takes on CAA rival Delaware Friday at 3 p.m. and Drexel Sunday at 1 p.m.